My son adores the Minions and so we have been going to McDonalds for Happy Meals so we could get the talking Minion toys. 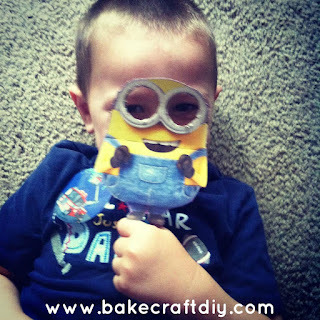 I loved the Minion on the side of the box because he was a whole and fairly large Minion, so I brought the box home with me and stuck it into my craft cupboard in the hopes that I could think of something to do with him. 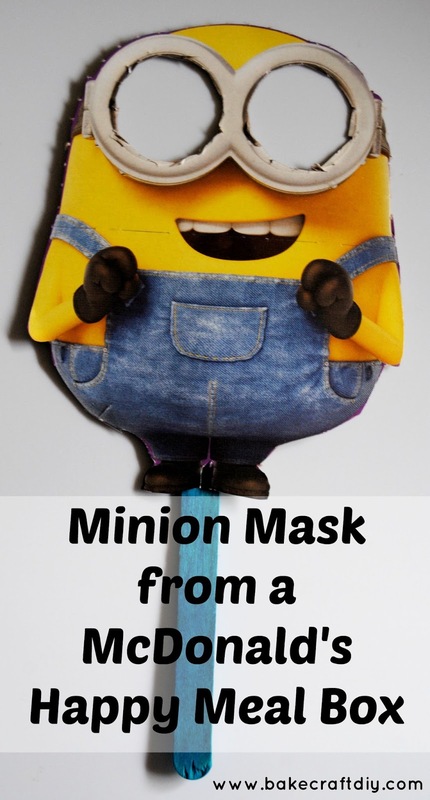 We had recently made the cow masks when I looked at the Minion and had an "aha" moment. So I cut out the Minion from the box, removed his eye added a popsicle stick and my son had his very own Minion mask just in time to see the movie. Side note: I found the movie a little too violent for a children's movie, it was rated PG, my son didn't seem to mind he is two and just enjoyed seeing the Minion on the giant screen. My son before we headed to the movie with his Minion mask thanks to the McDonalds Happy Meal box. We love easy crafts, happy meals and minions, so win, win win! Heeheehee. This is totally adorable! What a cute idea! Looks like it's a hit!